The Skylark Contour Fan Control is designed to conveniently set the speed of a ceiling fan. The control features a rocker switch to turn the ceiling fan on and off and a captive slide knob for fan speed control. Provides control of one ceiling paddle fan and 3 quiet fan speeds provide increased comfort. The control fits in large designer style openings for quick and easy installation, and coordinates with the Skylark Contour dimmers and controls line. Coordinating Claro wall plate sold separately. A convenient and hassle-free method of combating excess moisture in the air that causes mold and structural damage to your home. The humidistat senses increases in humidity and automatically turns the bath fan on regulating the moisture levels in the air for optimum comfort. For added control the humidistat comes with a timer from five to sixty minutes. Also comes with a light for extra illumination without the need for an extra electrical connection when spacing is limited. Cyclone's HushTone bathroom ceiling fan will very quietly and very efficiently clean out the polluted and stale air in your bathroom, leaving your home smelling fresh and clean. The special HushTone 110 is powerful enough to handle the most irritating pollutants and potent odours with a powerful one hundred and ten CFM fan. Features a convenient and hassle-free method of combating excess moisture in the air that causes mold and structural damage to your home. The humidistat senses increases in humidity and automatically turns the bath fan on, regulating the moisture levels in the air for optimum comfort. For added control the humidistat comes with a timer from five to sixty minutes. This photo sensor turns incandescent, LED, fluorescent, halogen or CFL lights on at dusk and off at dawn. It is for use in a rain-tight fixture or a dry location. Lighting controls can reduce your energy costs. Skylark Contour 1.5 Amp Single Pole/3-Way Quiet 3-Speed Fan Control, White The Skylark Contour Fan Control is designed to conveniently set the speed of a ceiling fan. The control features a rocker switch to turn the ceiling fan on and off and a captive slide knob for fan speed control. Provides control of one ceiling paddle fan and 3 quiet fan speeds provide increased comfort. 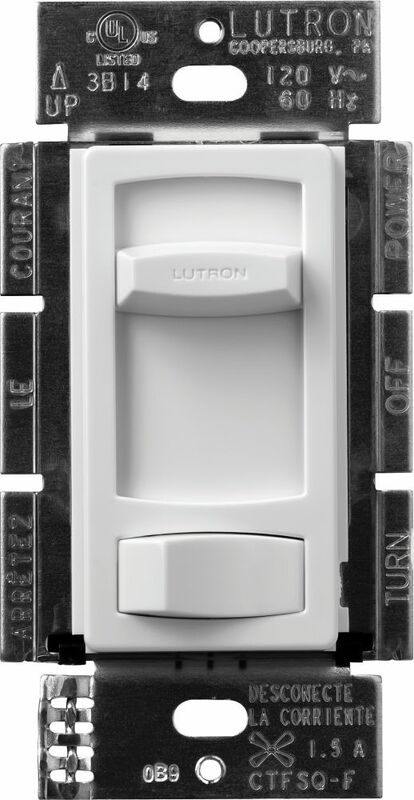 The control fits in large designer style openings for quick and easy installation, and coordinates with the Skylark Contour dimmers and controls line. Coordinating Claro wall plate sold separately.